good move minerva restaurant, originally uploaded by shashiBellamkonda. A few month's ago Noah Glass the founder of Go Mobo Payment systems had posted a Linkedin question "How can restaurants grow sales in this economy?" . it is a interesting debate. I have seen my lunch checks go up in price and have kind of lessened my going out for lunch. Minerva Restaurant in Herndon is a popular Indian food restaurant for Reston and Herndon folks and is always crowded for lunch. 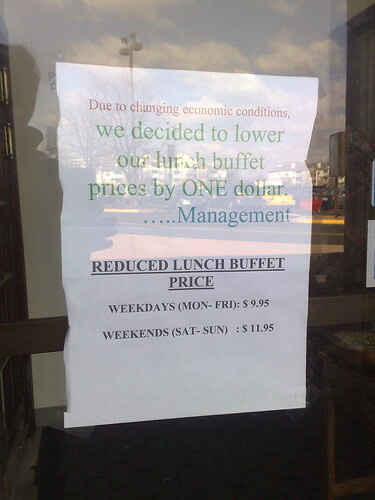 I was really happy to see the management had taken the trouble to reduce the buffet price and also put up this message on the door. drops of water make the ocean so every dollar counts not only in today's economy but all the time. If you do not care for savings then here is a suggestion - Go to minverva and then donate the dollar saved to the Capital Area Food Bank As for Minerva here is a link to Yelp Reviews for Minerva Please be honest.